Background: Human tuberculosis is a chronic inflammatory disease caused by mycobacterium tuberculosis. Pulmonary tuberculosis is the result of the failure of host immune system to control mycobacterium tuberculosis. The aim of the study was to asses the changes of the cytokines in active pulmonary tuberculosis patients before and after the use of anti-TB therapy. Methods: Multiple cytokine responses in active tuberculosis (TB) patients were investigated in this study following anti-TB drug therapy after 2 months. Ninety-six participants with pulmonary TB were engaged in the study between May 2018 and October 2018. Samples of blood were taken early before treatment at 0 and 2 months after using anti-TB therapy. The levels of interferon-gamma (IFN)-γ, interleukin-4 (IL-4), IL-6, IL-10, and tumor necrosis factor (TNF)-α in whole blood plasma collected from the QuantiFERON-TB Gold Plus were measured. Results: Compared with baseline levels, TNF-α, IL6 and IL10 were significantly lower following treatment whereas the IFN-γ and IL-4 increased significantly after treatment. 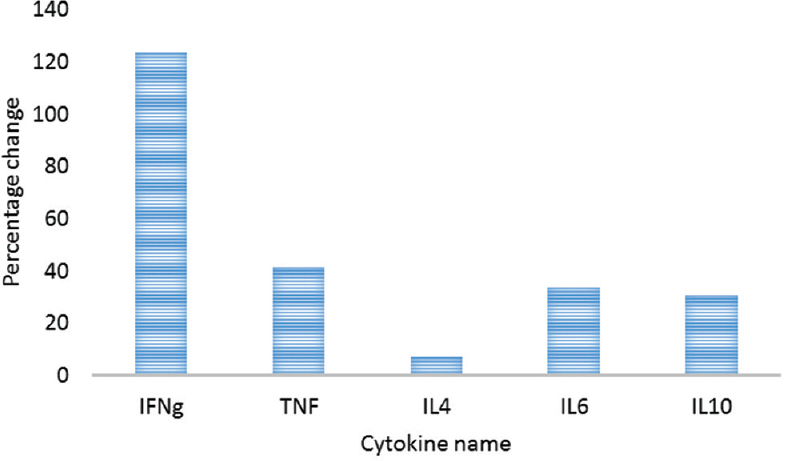 The responses of five cytokines varied significantly after treatment (P < 0.0001) where IFN-γ was highest compared to other cytokines with 123.6%, AUC=0.757 and P < 0001, TNF-α AUC: 0.529 and P = 0.743, IL-4 AUC:0.557 and P = 0.514, IL-6 AUC:0.629 and P = 0.047, IL-10 AUC:0.549 and P = 0.581. Conclusion: It is concluded that changes of cytokines that observed during the treatment of TB patients play a very important role in monitoring pulmonary TB and can be suitable biomarkers to assess the effectiveness of anti-TB therapy in patients with TB. Tuberculosis (TB) infection remains a major challenge globally. It is one of the leading infectious causes of death worldwide , responsible for an estimated 1.7 million deaths., In 2017, TB caused an estimated 1.3 million deaths among HIV-negative people, and there were an additional 300,000 deaths from TB among HIV-positive people. Tanzania is one of the highest burden countries with TB (among 30 countries) in the world. Mechanisms underlying host defense to Mycobacterium infection is poorly understood., In response to infection, host immune cells secrete a number of cytokines and chemokine signals , which play active roles in initiation and regulation of the immune response at various stages of disease development., Following anti-TB therapy, research has shown that the cytokine-mediated cell signaling is altered, which ultimately leads to recovery of the TB infection. The knowledge of understanding different cytokines at different stages of TB infection is necessary in knowing the host response after treatment. TB is an old disease, but still, there is an urgent need of rapid and precise monitoring tools to assess the early response of anti-TB treatment. Sputum culture status is the only acceptable biomarker for TB treatment response, but in resource-poor settings, the culture is unavailable. In additional waiting for the culture results for 6- 8 weeks to monitor the response of anti-TB is a challenge. The Ziehl–Neelsen sputum for smear is the available tool for diagnosis and the same time monitoring in resource-poor setting even though its limitations are well published. Sputum for smear is not useful for monitoring anti-TB treatment response as it is unable to distinguish live from dead bacilli. Using sputum has its limitation as for the patients with extrapulmonary TB and in children. Furthermore after 2 months of anti-TB medication to get quality sputum sample is difficult due to cough cessation or reduction, patients end up giving inadequate volume of sputum or excessive saliva. Given the limitations of using sputum for monitoring treatment, blood has been suggested as alternative. Cell-mediated immunity plays an important role in human host defenses against TB., The essential role of T cells in protection against TB infection has been well-documented., In this research, we studied changes of different cytokines in pulmonary TB patients following anti-Tb treatment after 2 months. The study was approved by the National Institute of Medical Research in Tanzania. All participants were given written informed consent. This was a prospective cohort study involving two sites. Participants with pulmonary TB were enrolled between May 2018 and October 2018. Patients were considered eligible for inclusion if they were >18 years of age and had sputum smear-positive pulmonary TB detected by GeneXpert. Exclusion criteria includes participants who refused to provide informed consent, participants with extra pulmonary TB, and participants who were very sick i.e unconscious. The QuantiFERON-TB Gold Plus (QFT-Plus) was performed in each patient from the baseline (before starting treatment) and at 2 months of anti-TB medication. The levels of interferon-gamma (IFN-γ), interleukin-6 (IL-6), IL-10, IL-4, and tumor necrosis factor-α (TNF-α) were measured consecutively in the plasma harvested from the QFT-Plus tubes. All methods were carried out in accordance with the manufacturer's instructions. The diagnosis of pulmonary TB was made based on clinical and microbiological status. Active pulmonary TB was confirmed using GeneXpert as derived from respiratory specimen (sputum). The standard regimen of fixed-dose combination of rifampicin, isoniazid, ethambutol, and pyrazinamide was used, and the dosage was given according to body weight of the patients. The duration of treatment was 6 months. The preparation of plasma samples was performed using the QFT-TB Gold Plus tubes according to the manufacturer's instructions. For each patient, 1 ml of blood by venipuncture directly into each QFT-Plus blood collection (nil, TB1, TB2, and mitogen) where TB1 and TB2 tubes had specific TB antigen early secreted protein antigen-6 (ESAT-6), culture filtrate protein-10 (CFP-10), and the blood was incubated within 16 h at 37°C of blood collection. The plasma samples were harvested after centrifugation and stored below −20°C until use. The plasma which was stored below −20°C was removed from the freezer and kept to room temperature until all ice were completely melted. The assay of all cytokines, such as IFN-γ, IL-6, IL-4, IL-10, and TNF-α, were performed using Human Premixed Multi-Analyte Kit with the catalog number LXSAHM, and multiplexing analysis was done using Luminex™ 200 system. All the samples and reagents were prepared according to the manufacturer's protocol. The analysis of data consisted of computing descriptive statistics for each study variable and then comparing them. Analysis of descriptive and inferential statistics was done using GraphPad Prism version 3.02. The baseline data were compared with final data using Wilcoxon matched-pair test. 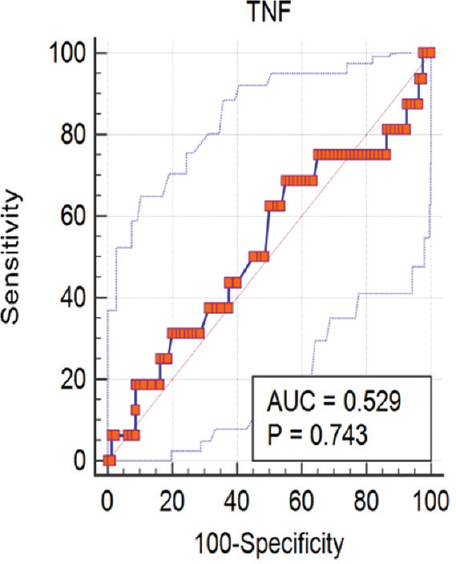 The responses of five cytokines were compared using Friedman test – a repetitive nonparametric one-way ANOVA alternative. In each case, a significant level was set at 5% with 95% confidence interval. 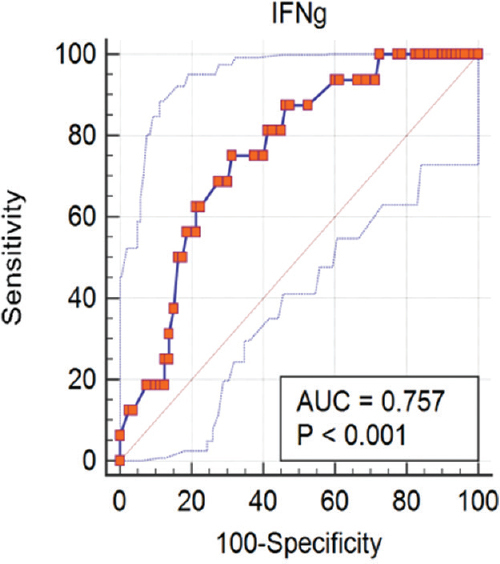 The power of cytokines to discriminate infection was tested by doing receiver operating characteristic (ROC) curve, where area under the curve (AUC) of 0.5 was considered. ROC curve analysis was done using MedCalc version 18.10−© 1993–2018 MedCalc Software bvba. The study involved 96 people with pulmonary TB. A TB case was defined by scores calculated by combination of symptoms and smear results. The results from the study showed that all patients (equivalent to 100%) had symptoms of TB before medication was initiated. After 2 months of medication, patients with TB symptoms dropped significantly to 15.6%. Similarly, median case scores decreased from 3.99 to 0.18 (P < 0.0001) [Table 1] and [Figure 1]. As indicated in [Table 1] and [Figure 2], the result showed significant changes of initial levels of each cytokine (P < 0.0001). Treatment of TB resulted into increased IFN-γ from 6.75 to 16.25 pg/ml and IL-4 from 2.5 to 2.8 pg/ml and the decreased TNF-α from 122 to 76 pg/ml, IL-6 from 88.25 to 56.5 pg/ml, and IL-10 from 89.7 to 61 pg/ml [Figure 2]. The percentage response for each cytokine is presented in [Table 2] and [Figure 3]. As indicated in [Table 2], the responses for five cytokines varied significantly after treatment (P < 0.0001), where IFN-γ was highest compared to other cytokines. 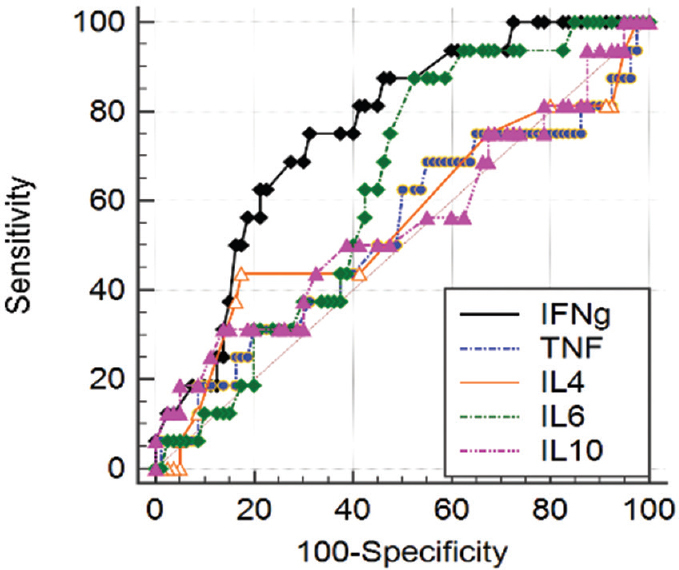 The percentage responses are summarized in [Figure 3], indicating that IFN-γ had the highest response of 123.6%, followed by TNF-α (41.5%), IL-6 (33.7%), IL-10 (30.68%), and IL-4 (6.9%). The ROC curves were used to analyze the discriminating power of the cytokines against the health status of study patients after medication. 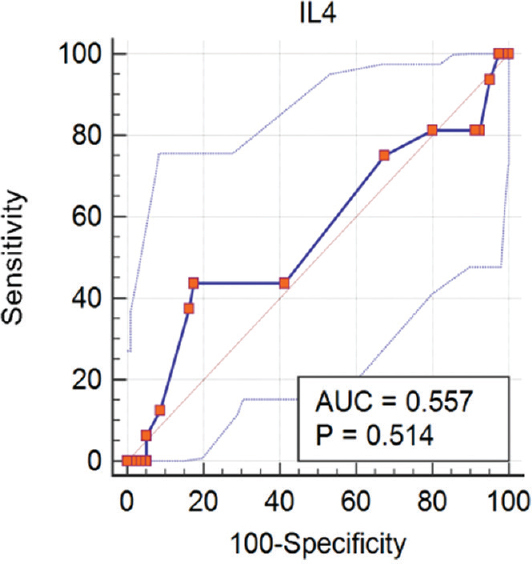 We saw that IFN-γ (AUC = 0.757, P < 0001) and IL-6 (AUC = 0.629, P = 0.047) had the ability to distinguish sick and healthy individuals. The corresponding sensitivity and specificity of each cytokine is shown in [Table 3] and [Figure 4], [Figure 5], [Figure 6], [Figure 7], [Figure 8], [Figure 9]. The profile of cytokine secretion in response to mycobacteria infection has been studied to identify immunological changes in active TB. Changes in cytokines could be designed as important biomarkers for monitoring progress of the patients with TB. There have been several studies that explained about the importance of cytokines as a biomarker for monitoring the progress of the patients using anti-TB. Previously, the most studied cytokine was TNF-α. One of the largest studies found that TNF-α increased after the use of anti-TB treatment. On Other studies where Tumor necrosis factor alpha was stimulated with TB- specific antigens reported to decrease after the use of anti-TB medication.,,, In our study, we found that after the stimulation of the cells with TB-specific antigens ESAT-6/CFP-10, TNF-α decreased following anti-TB therapy. IL-10 is an important anti-inflammatory cytokine reported to affect multiple cell types, such as macrophages, monocytes, dendritic cells, CD4+ T-cells, and CD8+ T-cells., It inhibits CD4+ T-cell responses by inhibiting the antigen-presenting cell function of TB-infected cells., Recently, the secretion of Mycobacterium tuberculosis (MTB)-enhanced intracellular survival protein from MTB cells was reported, which possibly increases IL-10 expression., Findings from different studies that have reported the role of IL-10 in TB infection are inconsistent.,,, One study reported that IL-10 increased with treatment. On the other hand, another longitudinal study reported the reduction in IL-10 levels after being in treatment. In this study, we found that IL-10 after being stimulated with TB-specific antigens decreased after anti-TB treatment. This decrease may be due to modified cytokine expression in infected individuals after treatment. IL-6 appears to be the major cytokine elaborated by mycobacteria-infected peritoneal macrophages(PMs) in vitro and thus may function as a potential biomarker of mycobacterial infection, either stand-alone or along with other cytokines. Several studies have investigated the responses of IL-6 during anti-TB therapy. Some studies reported decreased IL-6 during the intensive phase of anti-TB therapy.,, Other studies (two of which predominantly included HIV-positive patients) found no change of IL-6.,, In this study, IL-6 tends to decrease following anti-TB treatment. The increased levels of these three cytokines, such as IL-6, IL-10, and TNF-α, in active TB patients and their decrease following anti-TB treatment might be due to temporary stimulation of regulatory immune mechanisms that can lead to subsequent repair of immune homeostasis. 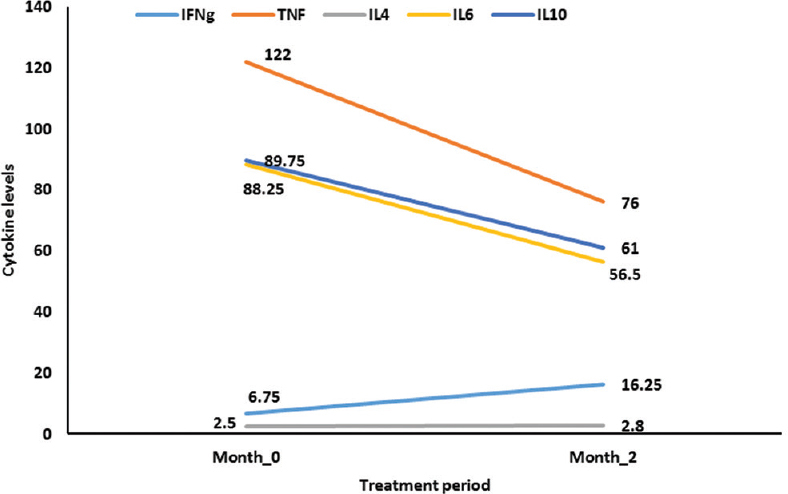 In this study, the increase of IFN-γ after 2 months could be due to the use of anti-TB therapy that cleared out the Mycobacterium, and this suggests the important role of IFN-γ in the response of immunity against MTB. Our study had some limitation such as small sample size (only 96 participants) and this is due to limited cases that met inclusion criteria and also few cytokines tested (5 cytokines). We could not continue with the study further up to 5 months of anti-TB where another blood samples could be taken which would allow us to observe the changes in cytokines up to the end of anti-TB therapy may be it would help to describe the better immunological changes up to the end of treatment to our participants. From the results of this research work, cytokine has a major role in immunological response during the pathogenesis of pulmonary TB. The use of anti-TB therapy effectively can cause immunological response in TB patients after 2 months of treatment which can be categorized by increase and decrease in secretion of cytokines these are IFN-γ, IL-4, and TNF-α, IL-6, IL-10 respectively. The studied markers herein can still be used to predict/determine early anti-TB response, which is crucial in determining whether a given treatment is effective or not, which may then help reduce unnecessary treatment cost that may be incurred in nonresponsive/resistant treatments. Future studies should include a large number of participants, and if possible, all forms of TB (pulmonary and extrapulmonary TB) and cytokine levels measured the entire course of anti-TB treatment. Finally, the cytokine concentration can be measured as early as 2 weeks after starting anti-TB. The authors acknowledge KIDH and KCRI authorities for giving permission to conduct this study. In addition, we acknowledge The Centre for Research, Agricultural Advancement, Teaching Excellence and Sustainability in Food and Nutritional Security (CREATES), for sponsorship in undertaking this research. We also acknowledge patients for voluntary participating in this study. The study was funded by the Centre for Research, Agricultural Advancement, Teaching Excellence and Sustainability in Food and Nutritional Security (CREATES), which also supported Happiness Mvungi's MSc study program at the Nelson Mandela-African Institution of Science and Technology in Tanzania. Clifford V, Zufferey C, Street A, Denholm J, Tebruegge M, Curtis N, et al. Cytokines for monitoring anti-tuberculous therapy: A systematic review. Tuberculosis (Edinb) 2015;95:217-28. Perez-Velez CM. Pediatric tuberculosis: New guidelines and recommendations. Curr Opin Pediatr 2012;24:319-28. Lawn SD, Zumla AI. Tuberculosis. Lancet 2011;378:57-72. Global tuberculosis report 2018. Geneva: World Health Organization; 2018. Licence: CC BY-NC-SA 3.0 IGO. World Health Organization. Global tuberculosis report 2017 (WHO/HTM/TB/2017.23). Geneva: WHO; 2017 Available from: http://apps.who.int/iris/bitstream/handle/10665/259366/9789241565516-eng.pdf. [Last accessed on 2018 Jun 21]. Grange JM. The mystery of the mycobacterial 'persistor'. Tuber Lung Dis 1992;73:249-51. Chowdhury IH, Ahmed AM, Choudhuri S, Sen A, Hazra A, Pal NK, et al. Alteration of serum inflammatory cytokines in active pulmonary tuberculosis following anti-tuberculosis drug therapy. Mol Immunol 2014;62:159-68.
Cooper AM. The role of cytokines in the initiation, expansion, and control of cellular immunity to tuberculosis. Immunological Reviews 2008; 226:191-204. Ameglio F, Casarini M, Capoluongo E, Mattia P, Puglisi G, Giosuè S, et al. Post-treatment changes of six cytokines in active pulmonary tuberculosis: Differences between patients with stable or increased fibrosis. Int J Tuberc Lung Dis 2005;9:98-104. Mensah GI, Addo KK, Tetteh JA, Sowah S, Loescher T, Geldmacher C, et al. Cytokine response to selected MTB antigens in Ghanaian TB patients, before and at 2 weeks of anti-TB therapy is characterized by high expression of IFN-γ and granzyme B and inter- individual variation. BMC Infect Dis 2014;14:495. Desikan P. Sputum smear microscopy in tuberculosis: Is it still relevant? Indian J Med Res 2013;137:442-4. Horne DJ, Royce SE, Gooze L, Narita M, Hopewell PC, Nahid P, Steingart KR. Sputum monitoring during tuberculosis treatment for predicting outcome: Systematic review and meta-analysis. The Lancet Infectious Diseases 2010;10:387-94. Leem AY, Song JH, Lee EH, Lee H, Sim B, Kim SY, et al. Changes in cytokine responses to TB antigens ESAT-6, CFP-10 and TB 7.7 and inflammatory markers in peripheral blood during therapy. Sci Rep 2018;8:1159.
Cooper AM. Cell-mediated immune responses in tuberculosis. Annual Review of Immunology 2009;27:393-422. Eum SY, Lee YJ, Min JH, Kwak HK, Hong MS, Kong JH, et al. Association of antigen-stimulated release of tumor necrosis factor-alpha in whole blood with response to chemotherapy in patients with pulmonary multidrug-resistant tuberculosis. Respiration 2010;80:275-84. Petruccioli E, Petrone L, Vanini V, Sampaolesi A, Gualano G, Girardi E, et al. IFNγ/TNFα specific-cells and effector memory phenotype associate with active tuberculosis. J Infect 2013;66:475-86. Kim CH, Choi KJ, Yoo SS, Lee SY, Won DI, Lim JO, Lee J. Comparative analysis of whole-blood interferon-γ and flow cytometry assays for detecting post-treatment Immune responses in patients with active tuberculosis. Cytometry Part B: Clinical Cytometry 2013;86:236-43. Mattos AM, Almeida Cde S, Franken KL, Alves CC, Abramo C, de Souza MA, et al. Increased igG1, IFN-gamma, TNF-alpha and IL-6 responses to Mycobacterium tuberculosis antigens in patients with tuberculosis are lower after chemotherapy. Int Immunol 2010;22:775-82. Young JM, Adetifa IM, Ota MO, Sutherland JS. Expanded polyfunctional T cell response to mycobacterial antigens in TB disease and contraction post-treatment. PLoS One 2010;5:e11237. Moore KW, de Waal Malefyt R, Coffman RL, O'Garra A. Interleukin -10 and the I nterleukin -10 R eceptor. Annu Rev Immunol 2001;19:683-765. Rojas M, Olivier M, Gros P, Barrera LF, García LF. TNF-alpha and IL-10 modulate the induction of apoptosis by virulent Mycobacterium tuberculosis in murine macrophages. J Immunol 1999;162:6122-31. Duan L, Yi M, Chen J, Li S, Chen W. Mycobacterium tuberculosis EIS gene inhibits macrophage autophagy through up-regulation of IL-10 by increasing the acetylation of histone H3. Biochem Biophys Res Commun 2016;473:1229-34. Sai Priya VH, Anuradha B, Latha Gaddam S, Hasnain SE, Murthy KJ, Valluri VL, et al. In vitro levels of interleukin 10 (IL-10) and IL-12 in response to a recombinant 32-kilodalton antigen of Mycobacterium bovis BCG after treatment for tuberculosis. Clin Vaccine Immunol 2009;16:111-5. Singh A, Dey AB, Mohan A, Sharma PK, Mitra DK. Foxp3+ regulatory T cells among tuberculosis patients: Impact on prognosis and restoration of antigen specific IFN-γ producing T cells. PLoS One 2012;7:e44728. Torres M, Herrera T, Villareal H, Rich EA, Sada E. Cytokine profiles for peripheral blood lymphocytes from patients with active pulmonary tuberculosis and healthy household contacts in response to the 30-kilodalton antigen of Mycobacterium tuberculosis. Infect Immun 1998;66:176-80. Singh PP, Goyal A. Interleukin-6: A potent biomarker of mycobacterial infection. Springerplus 2013;2:686. Wang JY, Chang HC, Liu JL, Shu CC, Lee CH, Wang JT, et al. Expression of toll-like receptor 2 and plasma level of interleukin-10 are associated with outcome in tuberculosis. Eur J Clin Microbiol Infect Dis 2012;31:2327-33.
da Silva TP, Giacoia-Gripp CB, Schmaltz CA, Sant Anna FM, Rolla V, Morgado MG, et al. T cell activation and cytokine profile of tuberculosis and HIV-positive individuals during antituberculous treatment and efavirenz-based regimens. PLoS One 2013;8:e66095. Su WL, Perng WC, Huang CH, Yang CY, Wu CP, Chen JH, et al. 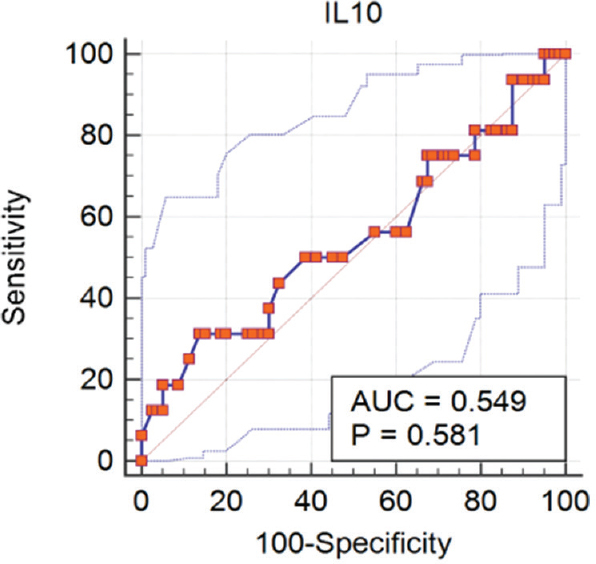 Association of reduced tumor necrosis factor alpha, gamma interferon, and interleukin-1beta (IL-1beta) but increased IL-10 expression with improved chest radiography in patients with pulmonary tuberculosis. Clin Vaccine Immunol 2010;17:223-31. Barnes PF, Lu S, Abrams JS, Wang E, Yamamura M, Modlin RL, et al. Cytokine production at the site of disease in human tuberculosis. Infect Immun 1993;61:3482-9. Raju B, Tung CF, Cheng D, Yousefzadeh N, Condos R, Rom WN, et al. In situ activation of helper T cells in the lung. Infect Immun 2001;69:4790-8. Turner J, Corrah T, Sabbally S, Whittle H, Dockrell HM. A longitudinal study of in vitro IFNγ production and cytotoxic T cell responses of tuberculosis patients in The Gambia. Tubercle and Lung Disease 2000; 80:161-9. Al-Attiyah R, Mustafa AS, Abal AT, Madi NM, Andersen P. Restoration of mycobacterial antigen-induced proliferation and interferon-gamma responses in peripheral blood mononuclear cells of tuberculosis patients upon effective chemotherapy. FEMS Immunol Med Microbiol 2003;38:249-56. Surcel HM, Troye-Blomberg M, Paulie S, Andersson G, Moreno C, Pasvol G, et al. Th1/Th2 profiles in tuberculosis, based on the proliferation and cytokine response of blood lymphocytes to mycobacterial antigens. Immunology 1994;81:171-6.
van Crevel R, Karyadi E, Preyers F, Leenders M, Kullberg BJ, Nelwan RH, et al. Increased production of interleukin 4 by CD4+ and CD8+T cells from patients with tuberculosis is related to the presence of pulmonary cavities. J Infect Dis 2000;181:1194-7. Lai CK, Ho S, Chan CH, Chan J, Choy D, Leung R, et al. Cytokine gene expression profile of circulating CD4+T cells in active pulmonary tuberculosis. Chest 1997;111:606-11. Lin Y, Zhang M, Hofman FM, Gong J, Barnes PF. Absence of a prominent th2 cytokine response in human tuberculosis. Infect Immun 1996;64:1351-6. Deveci F, Akbulut HH, Turgut T, Muz MH. 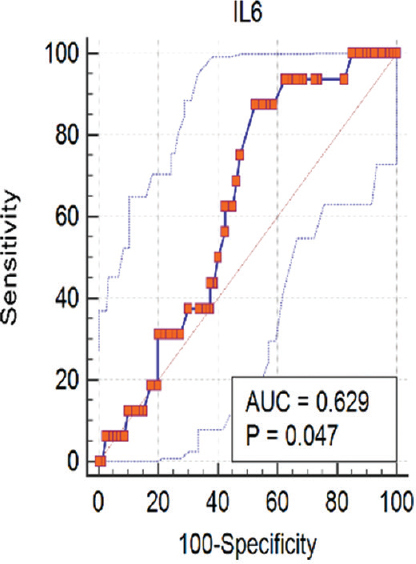 Changes in serum cytokine levels in active tuberculosis with treatment. Mediators Inflamm 2005;2005:256-62. Zhang M, Lin Y, Iyer DV, Gong J, Abrams JS, Barnes PF, et al. T-cell cytokine responses in human infection with Mycobacterium tuberculosis. Infect Immun 1995;63:3231-4. Verbon A, Juffermans N, Van Deventer SJ, Speelman P, Van Deutekom H, Van Der Poll T, et al. Serum concentrations of cytokines in patients with active tuberculosis (TB) and after treatment. Clin Exp Immunol 1999;115:110-3. Condos R, Rom WN, Liu YM, Schluger NW. Local immune responses correlate with presentation and outcome in tuberculosis. Am J Respir Crit Care Med 1998;157:729-35. Sánchez FO, Rodríguez JI, Agudelo G, García LF. Immune responsiveness and lymphokine production in patients with tuberculosis and healthy controls. Infect Immun 1994;62:5673-8.